Italian explorer ENI reports it has made a new oil discovery in the Afoxé exploration prospect located in Block 15/06, offshore Angola. “The discovery is estimated to contain between 170 and 200Million barrels of light oil in place”, the company asserts in a release, even though it admits the well had not been tested. The Afoxé-1 NFW well is located in the south-east area of Block 15/06, approximately 120 km off the coast, 50 km south-west from the Olombendo FPSO and 20 km west of the recent Kalimba-1 discovery. The well was drilled in a water depth of 780 meters and reached a total depth of 1,723 meters. “Afoxé-1 NFW proved a 20 meters net oil pay of high quality oil (37° API) contained in Upper Miocene sandstones with excellent petrophysical properties”, ENI explains in a very upbeat announcement. “The well has not been tested but an intensive data collection has been carried out that indicates a production capacity in excess of 5,000 barrels of oil per day. The new nearby discoveries of Kalimba and Afoxé are now accounting together a potential of 400 – 500MMBOE of high quality oil in place and represent a new cluster that can be exploited jointly in a new development concept. 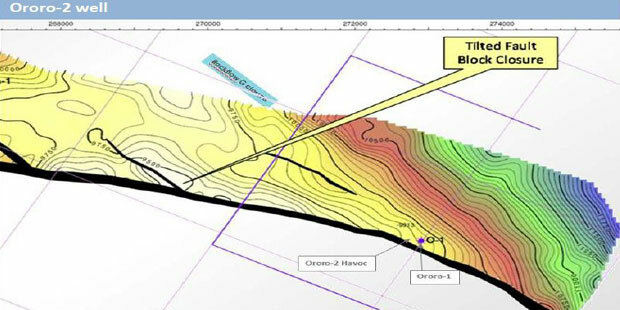 Afoxé discovery is a further confirmation of the oil exploration potential still held in southern part of Block 15/06, previously considered mainly gas prone. ENI is planning to drill up to 4 new exploration wells back to back in Block 15/06 during 2019”. Shell’s geoscientists have put a figure on the company’s recent gas and condensate discoveries, made in the course of a drilling campaign onshore Eastern Nigeria. The company encountered 1.5Trillion cubic feet of gas and 42 Million barrels of condensate, in shallow and deep reservoirs. The revelation came in the course of several technical sessions at the just concluded annual conference and exhibition of the Nigerian Association of Petroleum Explorationists (NAPE). 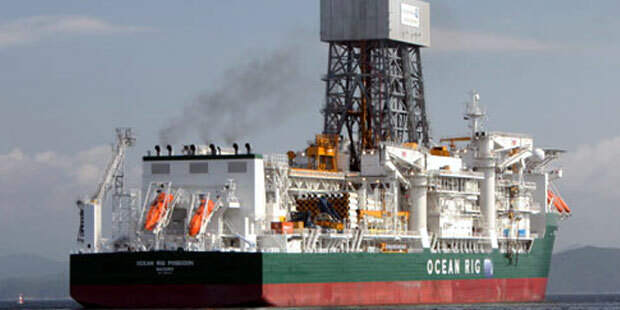 The four well campaign, which utilised the High Temperature/High Pressure rig Hilong 27, was aimed at deep, High Pressure gas targets in the Gbaran -Kolo Creek -Epu field areas, in what is classified as Central Swamp Depobelt of the Niger Delta Basin, to unlock all the reserves that are located deeper than normal hydrostatic pressure on these fields. It ran between 2014 and late September 2018, when the rig was released to the Nigerian Agip Oil Company, a local subsidiary of the Italian giant ENI. “You know how the Niger Delta works”, one ranking Shell earth scientist told Africa Oil+Gas Report on the side-lines of the NAPE conference. “You are targeting deep, but you can encounter new hydrocarbons in the shallow sands in the process”. Following its discovery of Kalimba 1 in June 2018, Italian major ENI set up an accelerated exploration programme in Angola’s Block 15/06, where it already has some producing fields. The company commenced a drilling campaign involving four (4) exploration wells. In the event of success, this strategy will enable a fast-track development of these new resources, leveraging on synergies with existing infrastructure and significantly reducing their time-to-market. In the first week of November 2018, ENI has signed, with state hydrocarbon company Sonangol, an amendment of Block 15/06 Production Sharing Contract which defines the new perimeter of the block, now covering an additional area of 400 km2 on the west side. The company says it increased production by 50,000BOEPD in the course of 2018 and is hoping to reach a peak of 170, 000BOEPD by early 2019. 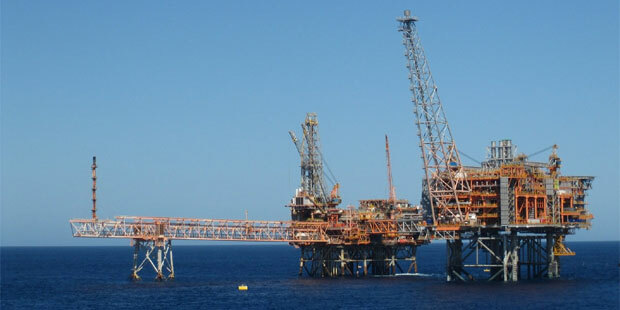 Block 15/06 (ENI Angola SpA 36.84% Operator, Sonangol P&P 36.84%, SSI 26.82%) is located approximately 130 km west of Soyo, in water depths ranging from 200 metres to 1,800 metres. The developed fields Sangos, Cinguvu, Mpungi, Ochigufu e Cabaça S.E. are tied back to the two FPSOs installed in the block, Ngoma and Olombendo, with an overall oil treatment capacity of 200,000BOPD. 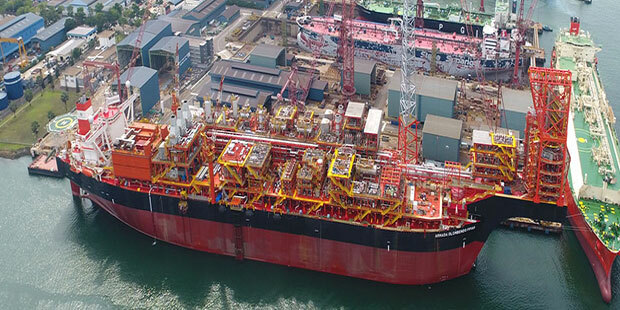 Ngoma and Olombendo FPSO started production in November 2014 and February 2017 respectively. ….only exploratory probe by a major oil company in South Africa in the last 25 years. TOTAL’s re-entry of the Brulpadda-1AX well on Block 11B/12B, offshore South Africa, is expected to spud by the end of December 2018. The Odfjell Deepsea Stavanger semi-submersible rig has been mobilized from the North Sea and is expected to arrive in South Africa in mid to late December 2018. 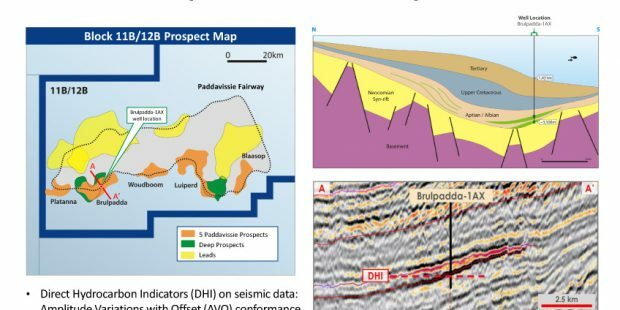 The Brulpadda prospect, at a water depth of 1,431 metres, was defined on two dimensional (2D) seismic data and is one of five submarine fan prospects with large prospective resources on the block. The well will test the southern Outeniqua Basin within the Paddavissie Turbidite Fan Complex. This is the only exploratory probe by a major oil company in South Africa in the last 25 years. TOTAL’s original contract with the rig company was expected to run between June 2018 and April 2019. The contract value, including compensation for mobilization /demobilization period, is estimated up to $55Million. The company expects the drilling of the firm well to take 60-80 days. TOTAL stopped drilling the Brulpadda-1AX well in September 2014 because of mechanical problems on Eirik Raude Ocean rig, caused by the challenging environment in the Agulhas, with its chaotic combination of currents, waves and winds. The company said it would return to site the following year, in late 2015. But by then the world of oil had dramatically changed from what it was in 2014 and far flung frontiers like ultradeepwater South Africa dropped off the priority. In late 2016, TOTAL spokespersons affirmed that the company would return to drill in South Africa in 2017. “There’s only a small window in the year that we can drill in this part of the continent”, a ranking TOTAL earth science executive told Africa Oil+Gas Report at the time. “The place is quite turbulent.” The 2017 date didn’t happen. 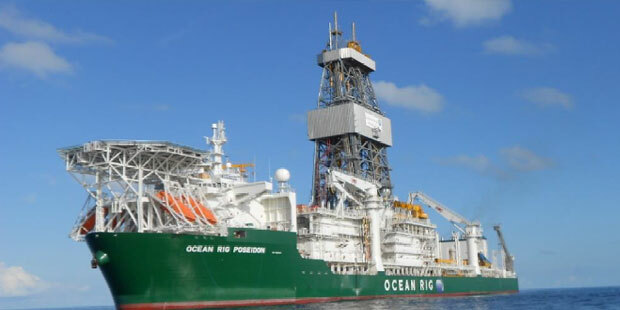 After waiting for over four months on COSL Force rig, Sirius Petroleum has moved on to an alternative for its two well drilling campaign on the Ororo field in shallow water Oil Mining Lease (OML) 95 offshore North western Niger Delta of Nigeria. The company now says it would utilise the Adriatic I jack up, operated by Shelf Drilling, and currently on duty on Amni Petroleum’s Okoro field in south eastern offshore Niger Delta. Sirius says it has decided, by mutual agreement with China Oilfield Services Limited (COSL), “to abrogate its agreement with the latter for the supply of a jack-up rig for the drilling programme on the Ororo field. 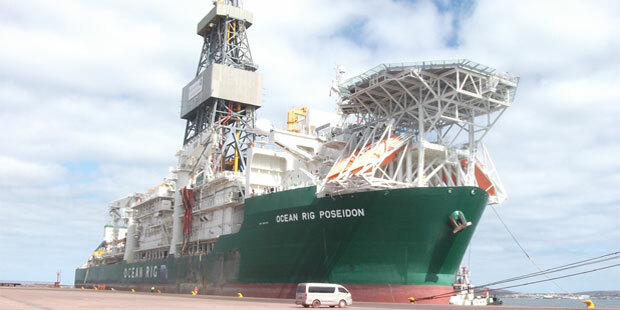 COSL Force rig was expected to have mobilized on its way to Nigeria, since June 2018 at the latest The Ororo field is held by Guarantee Petroleum and Owena Oil &Gas, to whom Sirius is a Financing and Technical Partner. But in early June 2018, Sirius reported that COSL Force Jack up rig had commenced critical equipment re-certification programme which it had to do “before it could be released to its next contract” That re-certification process has taken all the last four months. Sirius’ agreement with Shelf Drilling Limited is to supply its Adriatic I jack-up rig “which is scheduled to become available during November 2018”. Sirius’ statement indicates that the rig is concluding a well campaign with Amni, which is “utilising Schlumberger services and equipment on board the Adriatic I, and meets the specifications required for the Company’s proposed drilling programme at Ororo-2 and Ororo-3”. Sirius says that its Company’s operational budget for the Ororo drilling programme as disclosed in the Company’s admission document published on 30 November 2017 remains unchanged. Will Sirius Petroleum Spud Ororo-2 Before Year End? Sirius Petroleum has admitted, publicly, that the rig it announced would drill its first well on a Nigerian marginal field, has taken too long to arrive. COSL Force rig was expected to have mobilized on its way to Nigeria, since June 2018 at the latest. 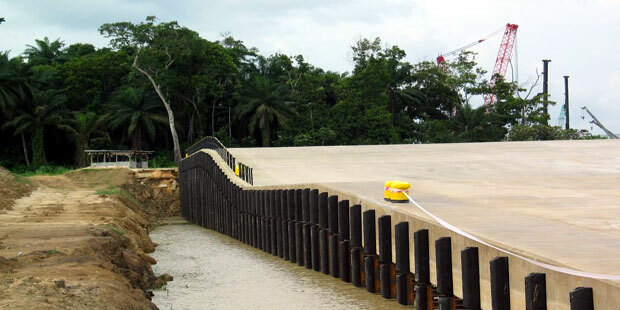 The China Oilfield Services Limited (COSL) operated jack-up is meant to drill Ororo-2 on the Ororo field in shallow water Oil Mining Lease (OML) 95. That asset is held by Guarantee Petroleum and Owena Oil &Gas, to whom Sirius is a Financing and Technical Partner. But in early June 2018, Sirius reported that COSL Force Jack up rig had commenced critical equipment re-certification programme which it had to do “before it could be released to its next contract”. Since that early June announcement, Sirius had not published any update on Ororo, until September 27, 2018, when it declared that it was currently waiting to conclude this process (of deploying a rig to site) which “has taken significantly longer than originally envisaged”. Sirius then said it was “at an advanced stage of concluding its rig requirements in order to achieve the spud of Ororo 2 in Q4 2018”, a very ambiguous statement. Sirius first mentioned it had a partial vendor financing deal with COSL in a late 2017 presentation, where it reported an Initial Ororo-2 well programme, delivering initial production of 2,700BOPD in HI 2018. “Sirius has the option to extend the well campaign to drill additional wells under the commercial arrangements with the service providers”, it had promised. Aker Energy, who purchased Hess Corp’s Ghana interest less than nine months ago, has set to work on the acreage, signing a rig contract and looking to drill in the next month and half. The Maersk Drilling operated ultra deepwater drillship Maersk Viking will spud the Pecan-4A appraisal well offshore Ghana latest November 2018. Aker’s contract with Maersk covers one firm well with an expected duration of between 30 and 35 days, with options for additional wells. The location of the probe is in an ultra deepwater depth of 2,674metres in the Deepwater Tano Cape Three Points (DWT/CTP) block. 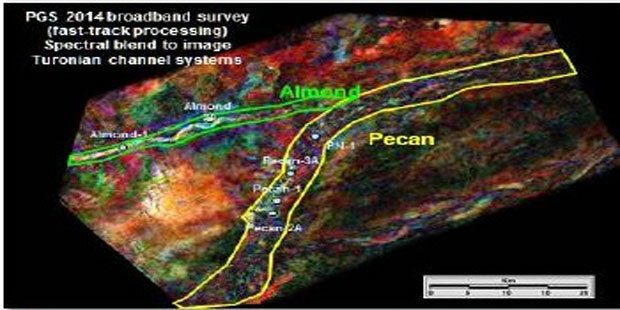 The main objective of the well will be to test the extension of the Pecan Field. This will give valuable and important input when optimizing the plan of development for the field and in understanding the wider appraisal potential of the block”. Aker Energy operates the DWT/CTP block with a 50% participating interest, LUKOIL (38%), Ghana National Petroleum Corporation (10%) and Fueltrade (2%). The first of the two wells scheduled to set off another round of drilling in Namibia, has come up as a duster. Tullow Oil operated Cormorant-1 exploration well on Petroleum Exploration License 37 (“PEL 37”) offshore the Republic of Namibia encountered non-commercial hydrocarbons. PEL 37 covers 17,295 square kilometers in the Walvis Basin, approximately 420 kilometers south of the Angolan-Namibian border. The Cormorant-1 well, located in 548 meters of water, was drilled by the Ocean Rig Poseidon drillship to a total depth of 3,855 meters. The well has been plugged and abandoned. The Cormorant-1 exploration well penetrated a 50-metre fan system within the Cormorant Prospect. Interbedded sandstones were encountered in the primary objective of the Cormorant-1 well but proved to be water bearing. Wet gas signatures, indicative of oil, were encountered in the overlying shale section. 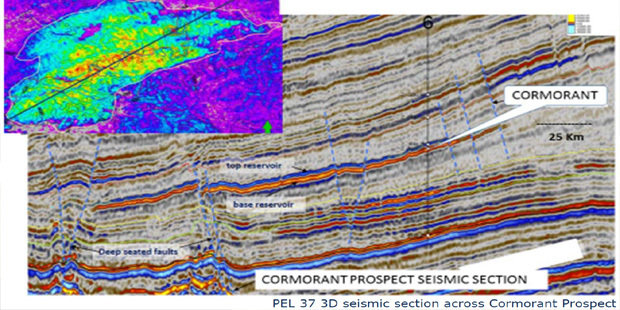 Important geological data has been gained from this well, and, in combination with high quality 3D seismic data, will provide valuable insights into the future prospectivity of PEL 37 where several additional prospects with significant resource potential have been mapped. Jan Maier, VP Exploration for Africa Energy, a minority partner with 10% stake in the project, says that his company is encouraged that the probe “confirmed the existence of a mid-Cretaceous aged deep marine fan sandstone system with further potential in the play.